"Did I just see your commercial on TV?" a friend tweeted me one night last week. Followed by more people from different states in the country sending me messages, tagging me on Facebook and telling me they just "saw" me on TV! Do these two smiling gals look familiar to you? 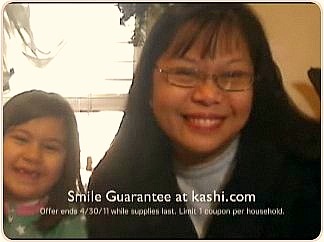 Apparently, the Kashi commercial where I and my daughter was a part of, finally aired that night. Wow! Talk about being literally the "talk of the town" for days - in a good way at least - but wow! My mom puts it best. "This is great news. Now you're a celebrity!" - Ok, she's my mom, what can I say? So, yes! I guess I'm "famous" until Kashi comes up with a new commercial. Yes, until then I'm a "celebrity". After all, a regular gal like moi' doesn't get included in a popular brand's TV commercial everyday. click on "now playing" with Jason Polinsky. Will you do the happy dance with me? Me in a Kashi Commercial? No way! That is so cool! Go you! Too cool, Maricris! Amy Bellgardt (@MomSpark) and I are in a local Oklahoma Chevy commercial. So happy for you on your national commercial and for your contest winnings!!! You go, Girl!